Installing Home Solar Panels Will Reduce Costs And Ease Todays Energy Concerns! With home solar panels you can eliminate or dramatically lower your power bills, heat your home water and pool and get federal and state refunds for solar power homes. Solar panels, which are also referred to as modules, are assembled with various components to create a home solar panel system. These systems will run your home completely independent of non-renewable energy sources or can be used to supplement your existing power and are categorized into 3 types. The connected or grid tie systems require no batteries, and are the simplest systems to use and install for solar power homes. Several home solar panels are wired together in an array. (More than one panel connected together) These panels convert sunlight into electricity and together generate a much larger amount of electricity than a single home solar panel. This array of panels is connected to your existing power meter. The electricity generated by your home solar power system is sent through an inverter, which is a piece of equipment that converts the dc (direct current) power that is generated by the solar array, into ac power (accelerated current, the type used for most home appliances). The converted electricity is first used to meet any electrical requirements in the home. (Appliances, lights etc…) If more electricity is produced than is needed, it is put back into your power meter, or utility grid. When you aren’t using all of the power produced by your home solar panel system, the meter will actually spin backwards selling electricity back to your power company at a retail rate. This is called net metering. At the end of the month a credit for the electricity sold is deducted from the charges for the electricity that was actually used. So even when you are not at home, your system is generating and storing power to be used for free or sold back to the power company! When your home solar panel system is not generating electricity, like at night or a cloudy day, you will use the power from the utility meter as always. Another option you have with a grid tie system but is not mandatory, is to install a battery back up system. If there is a power failure, you can then run your basic appliances like a computer, refrigerator, home security system, lights, portable heaters and other important appliances. See all the Power-Save Solar Grid Tie Systems. An off grid system is basically a free standing system and is not connected to your utility meter. Many times these home solar power systems are used in cabins and other areas where there are no power lines available. These solar power homes can be set up to be completely independent of any non renewable energy sources, provided the array of panels is large enough to supply the power necessary. Even if your on top of a mountain and have no access to power lines, you can still have full power in your home. 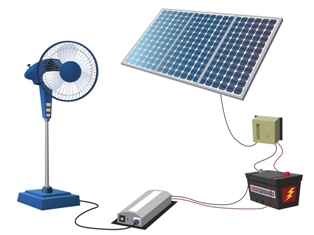 A typical off grid system has an array of solar panels, a battery bank that stores the dc power that is generated by the array, and an inverter to convert the DC power in AC power that you can use in your home. These stand alone systems often use a charge controller which prevents over charging of the battery. They will shut off the charging when the battery is completely charged to prevent damaging the battery. The batteries used for the off grid system are not the same as used in a car. They are called deep cycle batteries, like the ones in golf carts, and can be charged over and over without damaging the battery, while providing steady power over a long period of time. One thing you need to keep in mind is that some of these batteries are not totally maintenance free. In the unsealed batteries you will need check the fluid periodically and of course protect them from extremely cold weather. You can also add an extra level of safety by installing a generator with the battery back up system, so when power is running low in the battery, you the generator will kick in and add additional power to it. Other factors that will affect the performance of your home solar power system. The seasons will also make a difference in the solar arrays output. As the earth rotates on its axis the days are lengthened and shortened and the suns insolation will increase and decrease accordingly. Which direction should my home solar panels face? The greatest exposure to the sun is facing due south, so your array should be facing this direction to capture the most sun as it passes east to west. The angle on which your array is installed will also have an impact on the amount of power generated. In the northern hemisphere, an angle equal to your latitude will give you the best year round power output. If you want to adjust the angle for the highest performance then an angle equal to your latitude minus 15 degrees will be best in summer and an angle equal to your latitude plus15 degrees will be best in winter. Of all of the factors affecting the output of your residential solar panels, shading can have the most impact. Even a barren tree branch can reduce the residential solar panels efficiency by 80%. Make sure you take into consideration where the sun and shadows will be during the peak hours between 9:00 am and 3:00 pm. Also realize that an area that is not shaded in the summer may be completely or partially shaded in the winter. Your home solar panels should last at least 20 years, so ask yourself are those new trees in your yard going to be a shade problem when they grow up? You need to know this and plan accordingly. Helping to safeguard our precious environment while preserving your own valuable resources, your own money, is within your reach today. By choosing other alternative energy solutions such as home solar panels you can do just that. Return from home panels to solar power panels.